British readers of a certain age may associate the potential problems encountered by absent crusaders with a popular children’s television series (very) loosely based on Sir Walter Scott’s classic novel “Ivanhoe”. In this the eponymous hero, played by a very young Roger Moore in his pre-007 days, fought for right and justice on behalf of the absent Richard the Lionheart against the dastardly machinations of Prince John and his accomplices. The notion that Richard’s kingdom was under Papal protection during his absence did not, as far as I recall, ever figure in the script. Even the historic Richard discovered the shortcomings of Papal protection when he was held to ransom by the Duke of Austria and saw his lands invaded by Philip II of France; he was unsurprisingly not impressed by Innocent III’s conspicuous failure to uphold the protections from which he should have benefitted. Danielle Park concedes that Richard’s experiences did not represent the Papacy’s most glorious hour. She argues however that this was an exceptional case and that Papal protection was a necessary, if not sufficient, precondition for participation in the crusades, reassuring potential holy warriors that their worldly interests at home would not suffer from their absence. Her book seeks both the trace the development of the privilege over successive papacies and consider its application. 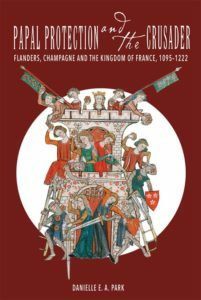 Her chosen case studies are drawn from the French speaking world- the Kingdom of France itself and the great principalities of Flanders and Blois/Champagne- with sideways glances towards England and the Empire. Park is very clear that the idea of Papal protection was a creation of Urban II himself at the time he was preaching what became the First Crusade, even if its content meshed with pre-existing concepts like pilgrim protection and the Peace of God. She makes a strong case, though some of her evidence hints at bishops and canon lawyers in the years after the Council of Clermont scrambling to put defined content into what may have been a rather vaguely formulated promise and then having to work through the consequences when it became clear that crusading was going to be an ongoing process rather than a one-off event. Predictably things became increasingly codified as trained lawyers got their teeth into the issues. In this context she suggests that the key moment came with the Second Crusade; the principles laid down by the Eugenius III in essence set the pattern for all that came later (another example of the current re-evaluation of the importance of that series of campaigns). Activist popes like Alexander III can be seen putting a lot of effort into upholding the privilege. By contrast, the usually dominant figure of Innocent III is cut down very much to size; such limited innovations as he made in the privilege were rapidly forgotten by his successors who preferred the definitions created by Eugenius. Park’s case studies focus on the role of the people she defines as “crusade regents”. These were (predictably) drawn from close associates of the departing warrior. In many cases the choice fell on his wife- indeed this almost seems to have been the default option- and Park looks closely at this area of female rulership and self-assertion. In cases where the wife was either unavailable (perhaps because she too was going east) or for some reason viewed as unsuitable, the choice usually fell on another close family member. The choice of what might anachronistically be called a professional administrator like Abbot Suger or William de Longchamps was rare and it is perhaps significant that both experienced considerable problems in exercising their powers. Suger was fortunate in having the back-up of Pope Eugenius III to hand- and in benefitting from a very favourable historiographical tradition. In less sympathetic eyes it is easy to imagine him becoming the byword for corruption and unfettered ambition that William was in English memory. On the whole, though, Park argues that the crusade regents did an effective job in upholding the rights of the absentee rulers and that this was recognised when the boss returned- for instance very few of their deeds required re-authentification. The job was eased by what look like conscious attempts to clear the books of outstanding issues before the would-be crusader departed. Park also hints that the constraints of crusade regencies may have been a stimulus for developments in bureaucratic governance. Park makes quite a strong case. One quibble would be that it is hard to discern much specifically papal involvement in the crusade regencies she examines. Obviously senior churchmen worked closely with the regents as part of the teams of “insiders” which were assembled to mind the shop but direct papal interventions were very rare indeed (largely confined to Eugenius III’s highly activist period in France). She works hard to distinguish between Papally-underwritten crusade regency and garden variety regency on behalf of an under age ruler in Champagne during the 1210’s and 20’s when one gave way to the other after the death of Thibaut III on crusade but in truth it is hard to see much practical difference. The key point was obtaining the support of Philip II of France with successive popes as at best useful support players in heading off competing claims on the county (themselves ironically based on an interpretation of the Papal crusade privilege). Some of the evidence Park cites when analysing the legal development of the privilege suggest that it offered considerable scope for activist popes to insert themselves into the workings of ecclesiastical and lay justice- but in relation to landholders and property owners of lower status than the territorial princes she focuses on. It seems that such humbler individuals were prepared to petition popes for assistance, and indeed by the end of the twelfth century to pay good money for written confirmation of their privileged situation even though in principle that flowed automatically from their crusader status. While it is always unfair to criticise an author for not having written a different book from the one they produced, it is a pity that she chose not to cast a few more glances further down the social scale to get a sense of how the Papal privilege operated in less exalted (but more typical?) situations. It has to be said that Park’s book has a strong whiff of the doctoral thesis about it, with a considerable amount of repetition and a close – at times slightly myopic- engagement with previous scholarship. This does not do a great deal for its readability. She has undoubtedly identified an important part of what one might define as the backstage mechanics underlying heroic or ghastly deeds in the Holy Land. Hopefully she may in future widen her focus to consider the fate of those unable to call on the services of Ivanhoe to protect their rights.